Just HAD to paint this scene of a water lily from Taylor Pond at the local nature preserve. 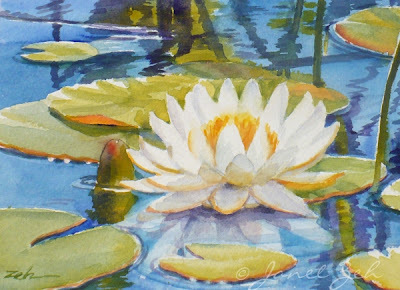 The lilies bloom so prettily there, and when I caught sight of this beauty, it took my breath away...the blueness of the pond reflecting a clear late summer sky, the little beadlets of water on the edge of the lily pads, the pure whiteness of the flower, the little ripples and reflections on the surface. These kind of things excite my paint brush!